Ah…Friday. The end of the work week and the beginning of fun. This weekend we are headed north of the border to visit Canadians. We don’t really know anyone that lives in Canada we’re just headed up there to have some poutine. Look it up my friends, it’s delicious. In reality we are going for a baseball game and a trip to the zoo. Boston is playing the Blue Jays on Saturday and we need to inaugurate our daughter into the world of sports at a real MLB game. Plus I want dip ‘n dots. IT’S THE ICE CREAM OF THE FUTURE. THE FUTURE! Since we were heading up to the game we decided, why not go to the zoo the next day and make it a little trip. Plus, other people should enjoy my screaming child at 3 am;just as I do. My apologies Mr. Traveler. I’m a list type of person, so when we are going on a trip I like to write down all the things we’ll need. That way I’m sure not to forget vital things; like underwear or Chinese finger traps. This is the first time we’ve traveled avec child so its bound to be a little more hectic; I predict it will be something similar to practicing meditation while on speed. The list started off fairly small, but it seemed to grow exponentially; as though it were some sort of bacteria that had found a way to reproduce on its own and take over mankind by drowning it in all the crap it lugged to this earth. In five minutes I had filled and entire page with things to bring for the baby. THE ENTIRE PAGE. She barely stands 2 feet tall and she requires an entire u-haul truck for a weekend trip. 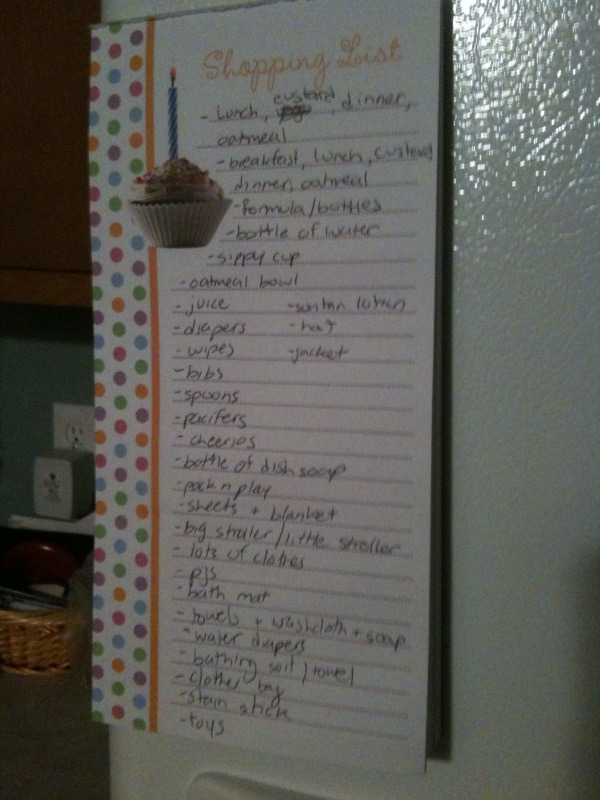 I wish it was the fact that I was bringing more than I needed to, but sadly, she’ll use EVERYTHING on that list. I think I might need a bigger bag.